The turn in the real estate market has not yet arrived for Weems Plantation in Tallahassee. While there are some traces of market improvement to be seen (like the decrease in distressed home sales as seen in the graph on the right), there is still much evidence of a tough 2013 ahead. 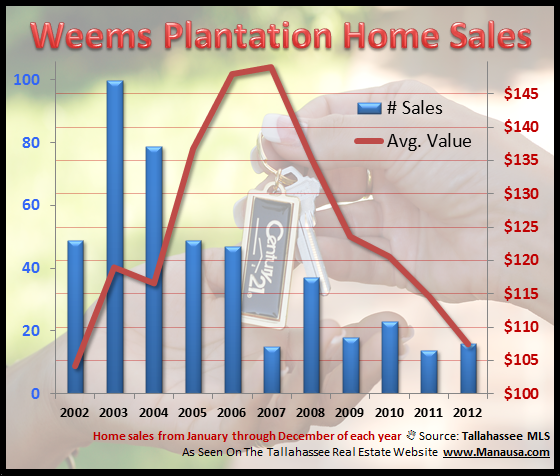 2012 did not bring about the increase in home sales for Weems Plantation that many other Tallahassee neighborhoods enjoyed. The real estate graph above shows that at merely 16 closed home sales in 2012, Weems Plantation has not rebounded like some of the other popular neighborhoods in Northeast Tallahassee. The blue bars in the graph show the number of closed home sales each year, while the red line measures the one-year trend of the average home value (measured in price per square foot). Home values have regressed back to levels last seen in 2002, and there is no evidence of a turn coming from the home sales recently recorded. This means that people who want to sell a home in Weems Plantation must understand the breadth of the competition. This also means that people who want to buy a home in Weems Plantation are going to be getting a heck of a deal. Currently, there are 8 homes for sale in Weems Plantation. Imagine owning a home today, financed at today's low interest rates, at a price you would have paid 11 years ago!